Premium sports watch for urban and mountain life. 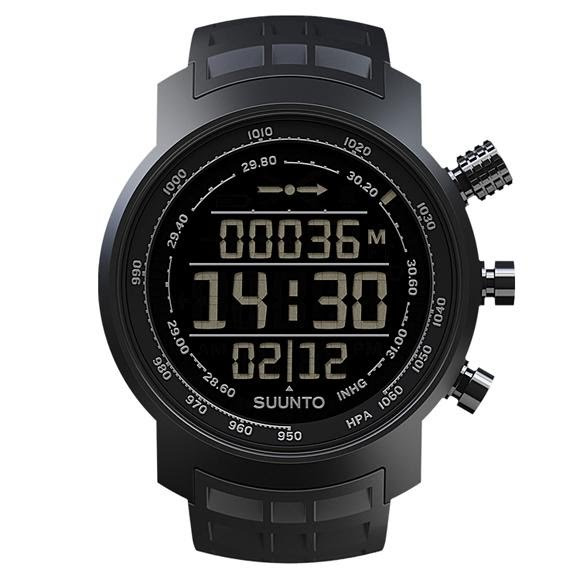 Suunto Elementum Terra combines decades of outdoors experience with a lifetime in precision craftsmanship, making it a survival tool no real adventurer can do without. The design of Elementum Terra is based on physical robustness with intelligent navigation ensuring it will perform solidly, regardless of conditions. Corrosion-resistant AISI 316L stainless steel case and buttons; sapphire crystal glass with anti-reflective coating; intelligent knob positioning for simplicity in scrolling; high-quality LCD display with metallic display graphics; water resistance to 100 m.
Whether hiking, skiing, snowboarding or in an office elevator, the altimeter function in Elementum Terra records relevant information about one&apos;s activity. The recordings can be stored as altitude logs that capture the maximum altitude reached throughout the duration of the trip. Furthermore, the logs show the overall cumulative ascent and descent of the given expedition. At the press of a button, the Terra transforms into an enhanced, 3D compass. As the watch moves on a wrist, the tilt compensation stabilizes the readings, providing the most accurate result and casting out unfounded presumptions.